Those who came to the Olympic Games had a wonderful time. We were able to help many travelers with their travel plans by taking advantage of our inside knowledge. We designed the perfect Vacation Packages for 2016 Summer Games for our customers. Below we left the initial information we posted on Vacation Packages to the Summer Games for those who still want to find information on the subject. You may like to take the opportunity to get to see other Brazil destinations as well. Brazil is a huge country and has plenty of things to do and see: from exciting big cities to small quaint villages, huge rainforests and waterfalls, untouched desert beaches and popular buzzing beach towns, historical and cultural cities are a few of the many options available. Let us organize the logistics of your vacation package, like accommodation, transfers, tours and anything else you may like. We are experts in Brazil and will make sure you have a good time in Brazil free of worries, in comfort and safety. Find all information here: Vacation Packages, Sports, Dates, Venues, Hotels, and Attractions. 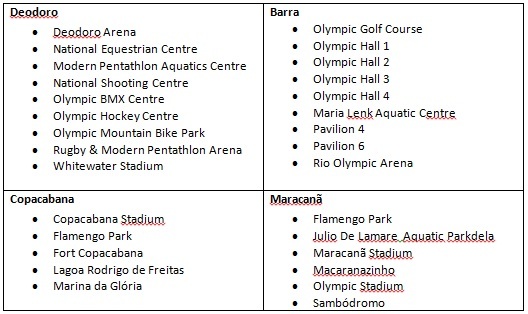 You will find below all information about 2016 Summer Games in Brazil: dates, sports, venues, transport and places to stay. Be careful when looking for tickets! Game tickets can only be sold by Authorized Ticket Resellers (ATRs) from their official websites. US citizens should be able to purchase tickets through JetSet. Residents of other countries will have ATRs specific to their region. The Summer Games are renowned for being the sports event that provides the most interaction with the locals and gets people excited about sportsmanship, with dozens of thousands of volunteers. It brings many sport varieties to the spotlight and inspires people to start practicing. The Games in Rio de Janeiro should be no different. The games are expected to have something like 140 thousand people directly involved, with 65 thousand people hired and 70 thousand volunteers. The estimation is that more than 10 thousand athletes will compete. Take this opportunity to visit other amazing destinations within Brazil and South America. We can recommend the best places to visit depending on your budget, interests and the time you have available. The games will run from Friday 5th to Sunday 21st of August 2016. The official start date for the Brazil 2016 Summer Games in Rio de Janeiro is Friday 5th August, when the opening ceremony will take place. However, there will be football (soccer) matches on 3rd and 4th August 2016, before the official start date. The closing ceremony will be on Sunday 21st August. The Paralympic Games will take place from Wednesday 7th to Sunday 18th September 2016. We can help you plan your trip based on the competitions you want to see and the dates you have available. The Brazil 2016 Summer Game Sports include aquatics (swimming and diving), archery, athletics (or “track and field”), badminton, basketball, boxing, canoe and kayak, cycling, equestrian, fencing, football, gymnastics, handball, hockey, judo, pentathlon, rowing, sailing, shooting, table tennis, taekwondo, tennis, triathlon, volleyball, weightlifting and wrestling and few others. 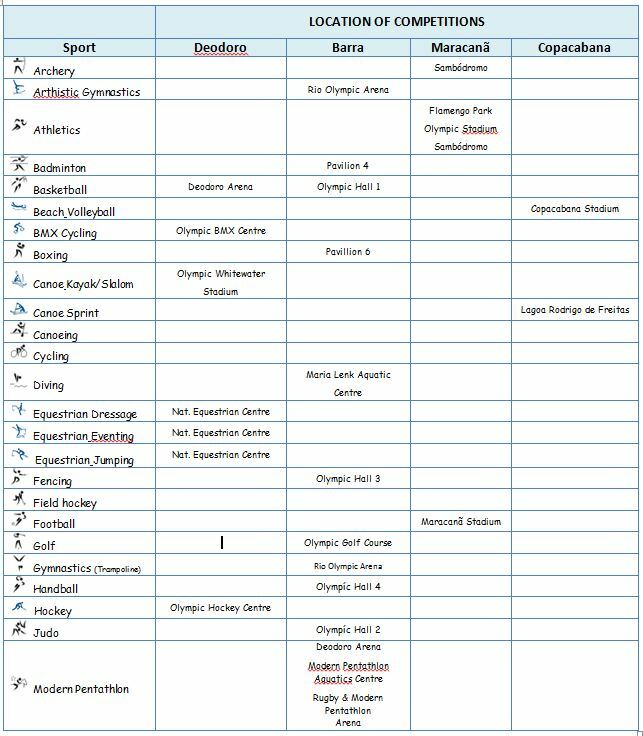 You will see below a couple of tables listing all the sports, when and where they will take place. We can plan a package including transfers to the games, tours and accommodation, as well as advise you on other destinations to visit, based on your availability. 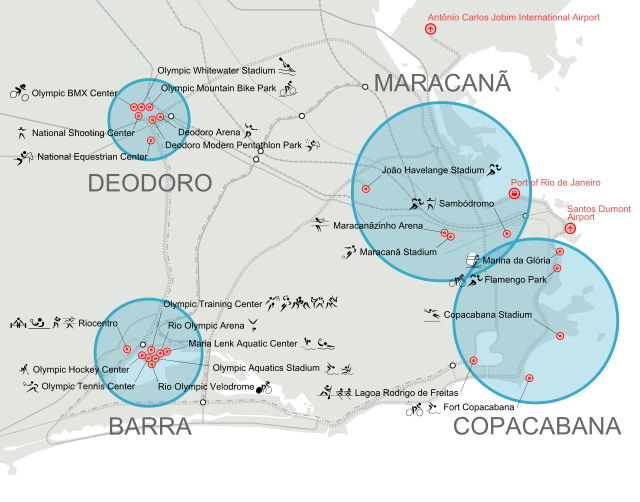 There will be 4 different areas: Deodoro, Barra, Copacabana and Maracanã. 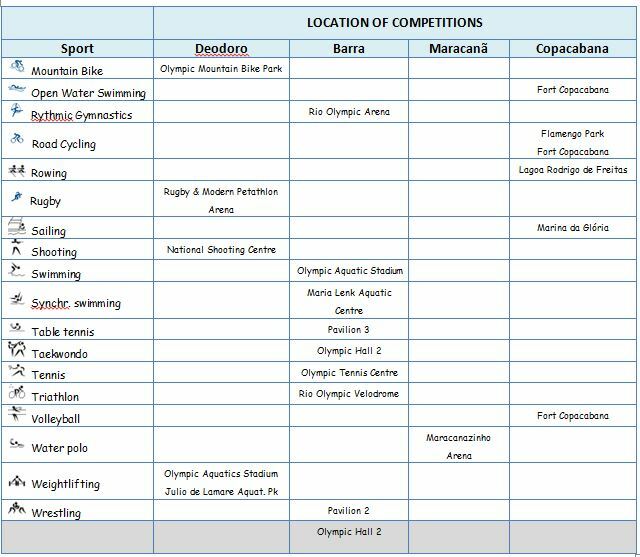 Each area will have a number of venues where the competitions will take place. Tell us what you want to see and we will arrange the transfer logistics for you. There is no lack of good hotel options in Rio for all budgets. Some of the nice areas we recommend are Copacabana, Ipanema and Santa Teresa. To avoid the city crowd while still close to the enough to come and go, you may choose to stay in one of the beautiful beaches that are just about one or two hours away, such as Búzios, Paraty, Ilha Grande and Angra dos Reis. We know all the ins and outs of Rio de Janeiro and indeed the whole of Brazil and can advise you on the best places to stay according to your interests, budget and availability. Rio de Janeiro is a very large city, divided into South and North zones (Zona Sul e Zona Norte). Rio´s most famous beaches, hotels, restaurants, bars and clubs are located in Zona Sul. 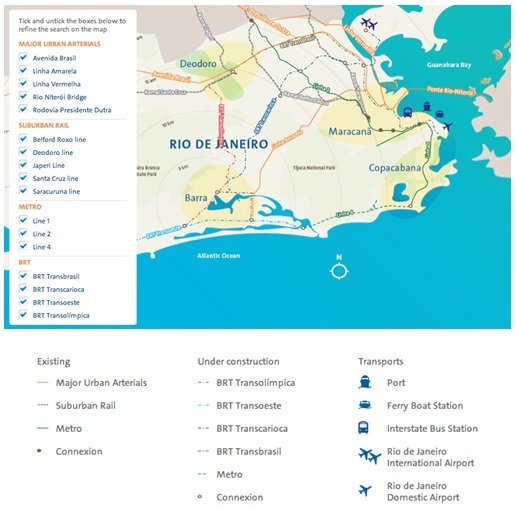 Rio´s underground network cannot be considered large, but it covers many of the city’s touristic attractions and runs from very early in the morning until late at night. This is the best way to get around the city. In addition to the existing lines, there are a number of new options under construction at the moment. These will be rail, metro and BRT lines, with the promise to take you right into the Competition areas. Taxis are another easy but slightly more expensive transport option since they can use the bus-only lanes. Official taxis are yellow with a blue line. We can arrange transfers to all competitions as well as hotel and airport transfers and tours with guides in any language.